Buy the Alarm Lock Trilogy DL2700 - Standalone Electronic Digital Cylindrical Pin Locks at discounted prices from Locksandsafes.com. The DL2700 is available in a Standard Key Override Model (DL2700) or an Interchangeable Core Model (DL2700IC). The lock is Grade 1 BHMA Certified with a rugged all metal keypad, which ensures long dependable life. This lock is one of the most popular locks in the Standalone Pushbutton Cylindrical Lock category from Alarm Lock. Install the lock in commercial places like offices, pharmacies and schools and get security at affordable prices. The locks hold up to 100 user codes (3-5 digits), which are 100% keypad programmable. Multilevel security: Master, Manager and Emergency, plus 3 Service Codes. Lockout individual, group or total (all) users. Non handed for easy installation. Uses 5 standard AA batteries for a long life. Install the lock within an hour and with 5 AA you do not have to worry about changing batteries for up to 5 years or 75,000 cycles. Finishes - Both the DL2700 and DL2700IC come in a US26D Satin Chrome Finish. Other finishes including Polished Brass and Duronodic are available upon request. 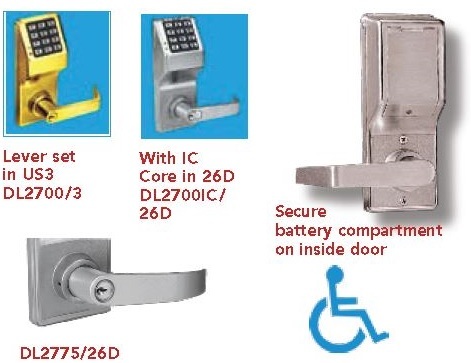 Alarm Lock is a leader in the design and manufacture of commercial door technology solutions for over four decades now. 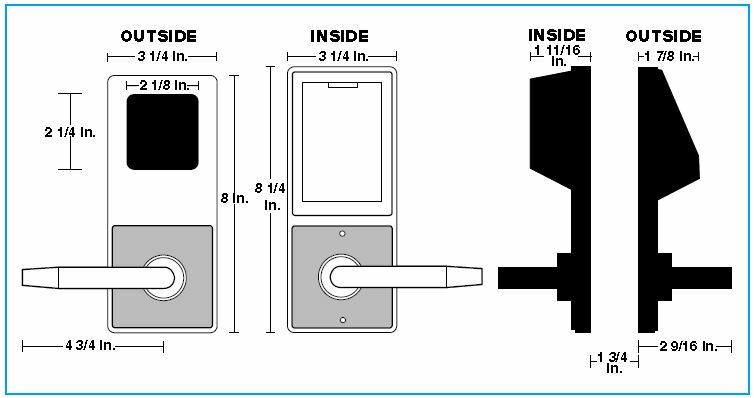 The company's Trilogy® Electronic Digital Pin Locks includes standalone digital and prox models. The Trilogy locks are known for their high quality, reliability and integrity. Grade 1 Durability. Grade 1 lockset, rugged all metal keypad. Upto 100 different user codes (3-5 digits). Master, manager and emergency, plus 3 service codes. Clutch mechanism permits turning lever without retracting latch and reduces stress on lock bodies and spindle. Outside lever free turning in locked position. Entering access code, key bypass, or remote bypass will allow lever to retract latch. Inside lever always instant egress. Solid brass 6 pin tumbler cylinder pinned 5, SC1 keyway, furnished in all locks. Additional tailpieces included: HW580 fits Schlage, Corbin/ Russwin CL, Sargent 480 Series, ASSA65-611. Model HW620 fits Ilco and Lori cylinders. INTERCHANGEABLE CORE MODELS: Accepts 6 & 7 Pin Cylinders from: Best, Arrow, KSP, Medeco Keymark & Kaba Peaks. Also available IC Core models for Yale, Medeco, Sargent, Corbin/Russwin CL and Schlage. Alarm Lock Tailpiece is supplied; IC Core is not included. STRIKE: 1 1/8” x 2 3/4” T strike & 1 1/4” x 4 7/8” ASA strike included. With screws for wood or metal jambs. FINISHES: US3 polished brass, US26D satin chrome, 10B Duronodic. POWER: 5 AA alkaline batteries (supplied), provide up to 5 years long battery life &/or approximately 75,000 cycles, typ., engaging Trilogy's unique Flex Drive motor, depending on actual lock usage. Audible low battery alert. DOOR PREP: Standard ANSI A115 Series Prep, modified by adding additional through-bolt holes. Cleanly, simply retrofits standard locksets.